Jena (27 September 2018) The Friedrich Schiller University Jena (Germany) was granted funding for one Cluster of Excellence. As the Excellence Commission announced today in Bonn, Jena's proposal for the cluster 'Balance of the Microverse' is among the 57 selected consortia which will be funded by the German Excellence Strategy for the following seven years. In the Cluster of Excellence 'Balance of the Microverse', the University cooperates with its University Hospital and external research institutions. After having been among the winners with its Graduate School 'Jena School for Microbial Communication' in 2007, this is the first Cluster of Excellence for Jena. "That is great news for the University, for the research location Jena, and the Free State of Thuringia," the President of the University, Walter Rosenthal, is thrilled with the decision. "It proves that middle-sized universities may also belong to the most outstanding German institutions of higher education." According to him, the decision acknowledges the profile that the University has developed over the past few years — with the motto 'Light, Life, Liberty'. The President is certain this success ultimately puts the scientific and economic region Jena on the global map. "Firstly, I would like to thank my colleagues for the strong commitment on which this very success is based. Secondly, I also thank the Free State of Thuringia for its intensive support." Cluster of Excellence "Balance of the Microverse"
Society is currently facing huge challenges: pathogenic microorganisms being resistant to antibiotics and polluted soils, to mention but a few. The researchers of the Cluster of Excellence 'Balance of the Microverse' in Jena can significantly contribute to solutions for those. 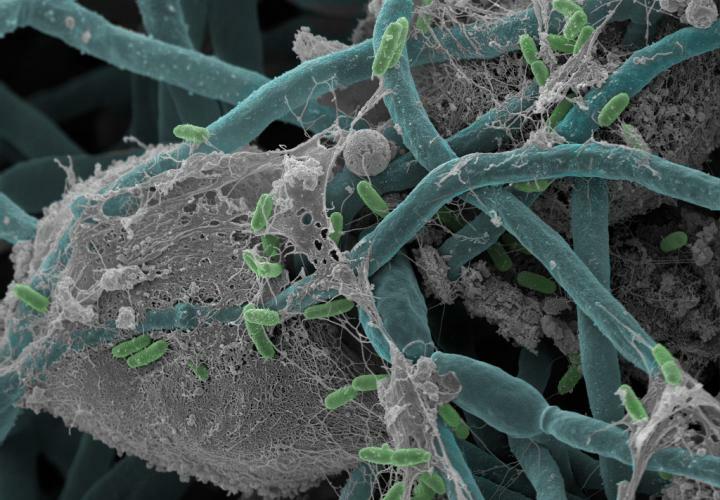 Nature is full of complex microbial communities — the microbiota. These may have a stabilizing influence on living creatures and the environment, for instance, on the health of human beings, animals, and plants as well as on the fertility of soils or the water quality. While there is a wide knowledge about the composition of such microbiota available, the functions and dynamics of such systems still have to be examined. The objective of the research activities is therefore to find out the general principles on which microbial communities interact with each other. The crucial questions are what factors may stabilize such systems and how humans may intervene with target-oriented measures to repair a microbial community which lost its balance. The research programme should advance the thematic and methodological scope of the Graduate School 'Jena School for Microbial Communication' and of four existing Collaborative Research Centres. "We are absolutely pleased about the fact that our commitment of the past years has been given the label of excellence and we thus rank among the top research institutions," says the spokesperson of the Cluster, Professor Axel Brakhage. As he says, all participating disciplines and institutions have evolved into a fantastic team. "The elucidation of the function of microbiota would provide completely new preventive measures and therapeutic approaches to diseases and the environmental protection." In the new research network, researchers from several of Jena's faculties are involved: Faculty of Mathematics and Computer Science, Faculty of Physics and Astronomy, Faculty of Chemistry and Earth Sciences, Faculty of Biological Sciences, and Faculty of Medicine. The University cooperates with external partner institutions, too: Max Planck Institute for Chemical Ecology, Max Planck Institute for Biogeochemistry, Max Planck Institute for the Science of Human History, the Leibniz Institute of Natural Product Research and Infection Biology (Hans Knöll Institute), the Leibniz Institute of Photonic Technologies, the Fraunhofer Institute for Applied Optics and Precision Engineering, the Helmholtz Institute, and the DLR Institute of Data Science. Led by the motto 'Light, Life, Liberty — Connecting Visions', the Friedrich Schiller University Jena will advance its profile in the upcoming years. In this context, the successful Cluster of Excellence 'Balance of the Microverse' has a vital role. A cluster of the universities in Jena and Würzburg with other partners, which was not granted the funding within the Excellence Strategy, represents another focus of the University. The joint cluster 'Enlightening the Receptome' is about to systematically research the receptome and its diversity as a whole. Both clusters thus play a central part in developing the University's profile lines 'Light, Life, Liberty'. In cooperation with the University Hospital, external research institutions, and research-oriented companies, the researchers of the Friedrich Schiller University Jena will take on global challenges, for example, climate change, a sustainable energy supply, ageing, personalized therapies, social change, or the struggle against infectious diseases. "Being the only Thuringian institution of higher education supported by the Excellence Strategy, we want to fulfil great expectations," emphasizes the President Walter Rosenthal. For further information on the Cluster of Excellence, please visit: http://www.microverse-cluster.de.